The best kids tales are often the creepiest, most perverse and, ultimately, most moral. 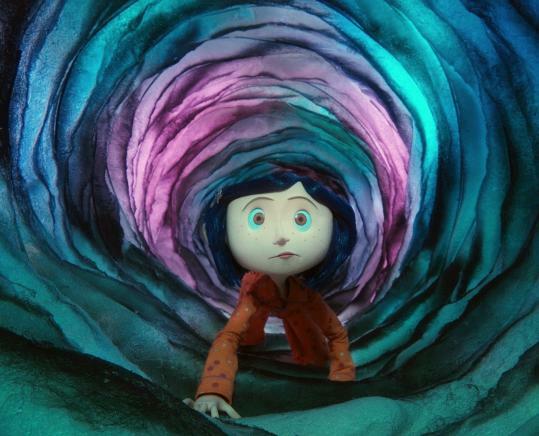 Dakota Fanning, CORALINE — Every year, I make a point of seeking out voice roles in animated films (though only 1 of the 4 I short-listed made the cut this year). It’s a legitimate form of acting that Oscar hardly ever acknowledges. Fanning’s got girlish curiosity and frustration to spare in her voice. Alison Lohman, DRAG ME TO HELL — Every year, I make a point of seeking out roles in action or genre films, another legitimate form of acting that Oscar hardly ever acknowledges. She both exudes non-obnoxious middle-class entitlement and convincingly sacrifies a kitten. Melanie Laurent, INGLORIOUS BASTERDS — Where does Tarantino find these unknown (to me anyway) or thought-washed-up actors who somehow give credible performances in the “movie movie” roles. Probably hurt by Diane Kreuger’s even greater awesomeness (in a showier and “movie”-er role). Robin Wright Penn, THE PRIVATE LIVES OF PIPPA LEE — Sometimes you just give pity consideration that a good and talented actress found herself stuck with such a ridiculous script and managed to come out not completely sucking. The key is not to overplay the too-many Big Scenes. Emily Blunt, THE YOUNG VICTORIA — An awards-bait role but at least it’s not a glorified impersonation, as we have no recordings or photos of Victoria from this era (her earliest photo dates from 1844). Blunt’s playing gives us a mostly feminist-anachronism-free portrait of a woman who, because she wields (even-limited) political power, can’t let men take advantage of her. So, nah … Catharine MacKinnon is full of it.